Tim- "The One-77 is a truly remarkable car and although I spend a great deal of my time around this type of vehicle, and very often Aston Martin's, I was still impressed over by both its beauty and design, the famous Aston saying of 'power, beauty, soul' certainly applies here. The shoot was commissioned by Hasselblad in Denmark and was to show both the car overall and some of the close detail captured using my Hasselblad H3 DII camera for the advertisements that would run a strap line of 'Getting Down to Details'. The actual shoot came at very short notice with only 2 days to prepare as Aston had only one model available and built to work with and as you can imagine the car was very much in high demand around the world for events and shows as it was just at the stage of being officially unveiled and launched by Aston. All the work I did was shot at Aston's Design Centre in Gaydon and I managed to get a few hours with the car so that we could complete a range of photographs that hopefully do the car and the camera justice." 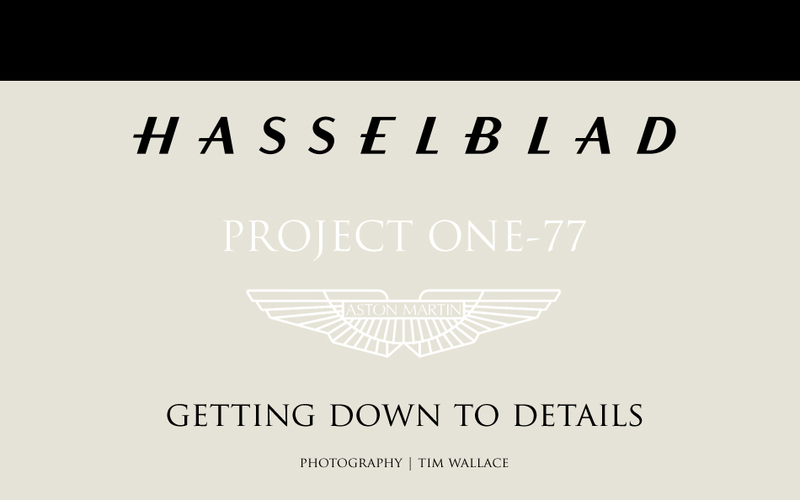 The Hasselblad advertisements will be running in the Aston Martin AMOC Book for 2010 and the work that Tim shot is being exclusively shown on the main global Hasselblad site along with a sample of just some of the work shot.